Kevin Rooney just couldn’t stop smiling. After a great save denied his New Jersey Devils teammate Drew Stafford from a goal, the puck slid invitingly into Rooney’s path as he skated in from the right circle. He took a look up and smashed a one-timer inside the far post for the first goal of his NHL career. The former Canton High standout and star of the 2010 Div. 2 state champion team wheeled away to the far boards with a grin that stretched from ear-to-ear. Even as the teams lined up for the ensuing face-off, the smile remained. Rooney can be forgiven for wanting to savor that moment. His path to the NHL was not preordained. He wasn’t a can’t-miss prospect coming out of high school or after two years at Berkshire Academy or even after four years at Providence College, where he was part of the program’s first national title in 2015. Making it to the top level was all about hard work. It is no surprise that Rooney found his way onto the ice. His uncle Steve graduated from Canton in 1981, played at PC, and then went on to play for the Montreal Canadiens, Winnipeg Jets, and the Devils. His cousin Chris played at PC and his cousin Joe played at Boston College. His father David played at Canton and his brother Bryan was part of the 2009 Canton team that went to the state title game and then played at Stonehill College. Canton Youth Hockey was the starting point and he also played with the South Shore Kings leading up to high school. When he got to Canton High, Rooney wasn’t an instant sensation. Shuman remembered him scoring maybe a handful of goals as a freshman for a team that went 15-5 and won the league title. Even the following year, the Bulldogs won 18 games, another league title, and reached the state championship game, but it was Bryan Rooney, not Kevin, that was the star. It was the work that he put in between his sophomore and junior seasons that turned Rooney from a good high school player into a legit college prospect. Even though both Rooney and Shuman admit the 2008-09 team was probably a deeper team, it was the 2009-10 team that would bring home the trophy, avenging the previous season’s loss to Newburyport in the TD Garden. Shuman credited Rooney’s ability to make the players around him better for being a catalyst to the Bulldogs winning it all. “It’s so hard to have people to believe this when I say it but that was the most fun hockey I’ve ever been a part of and it’s something I’ll cherish for the rest of my life,” said Rooney. “Those memories at Canton High were some of the best I have and it’s because you’re playing with kids you grew up with. Your best friends are your teammates, and just being able to play in front of your hometown every game is something special. During the 2009-10 season, college scouts noticed Rooney and suggested he had the potential to play at the next level but that he might need to make a move to achieve that dream. Once the season was over, Rooney sat down with Shuman to discuss his future. In the end, he had accomplished all that he could with the Bulldogs and he decided to transfer to Berkshire Academy to continue his development as a player. Once the decision to leave Canton was made, Rooney knew that he had to make it count and develop his game to play at the next level. He said, “ I don’t want to leave and then just end up going to college and not playing hockey.” His two seasons at Berkshire led to a few offers and he chose to play with his cousin at PC, coming in as part of new head coach Nate Leaman’s first recruiting class. In 2015, Rooney returned to the TD Garden, where he won the state title for the Bulldogs, and helped PC beat Boston University in a dramatic final to win the national title. “I’ve got some pretty special memories at the Garden for sure,” he said. “First was the state title, then the national championship, and my second NHL game was there too.” That season was also the first time that Rooney started thinking about his pro prospects and he attended developments camps in Toronto and Chicago that summer. He signed an amateur contract with Albany of the AHL following his senior season at PC. He scored 13 goals and recorded eight assists in 71 games. The Devils signed him to his first NHL contract in February 2017. Two nights later, Rooney took the ice against the Washington Capitals. Since signing with the Devils, Rooney has bounced back and forth between the big club and its minor league affiliate in Binghamton. He admits that it is difficult to not have a consistent place on the roster but that he has learned from other players who have gone through the same situation and is keeping his focus on doing whatever the team needs and securing a consistent role with the Devils. It is rare for players to come through the Hockomock League and play professionally and Shuman believes that Rooney is an inspiration not only because of where he ended up but how he got to this stage in his career. In the first period of Thursday night’s game against the New York Islanders, Rooney raced into the attacking zone with the puck and ripped a shot high on the glove side to put New Jersey in front. 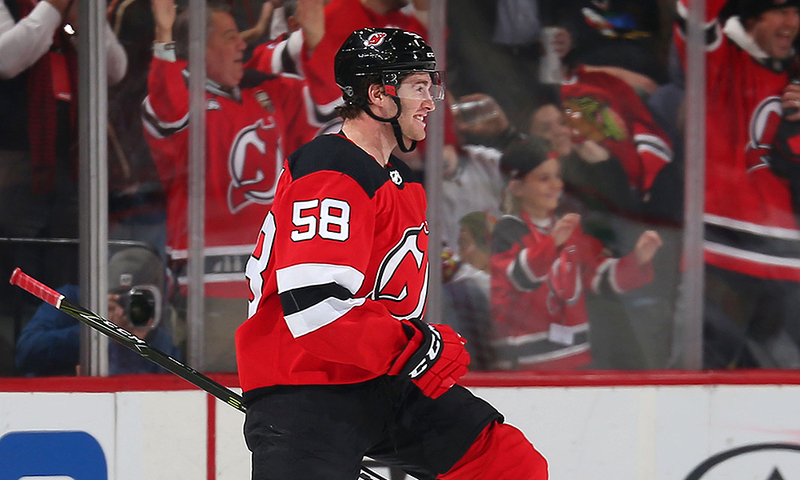 It has been a long road from the Ponkapoag Rink to the NHL, but no matter where he is playing Kevin Rooney continues to make his mark.